This was the third of the K-12 distance, online, and/or blended learning articles I references in Friday’s New Issue of Online Learning Journal Published entry. This was the second of the K-12 distance, online, and/or blended learning articles I references in Friday’s New Issue of Online Learning Journal Published entry. 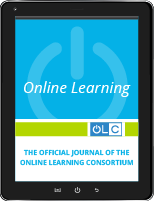 This was the first of the K-12 distance, online, and/or blended learning articles I references in Friday’s New Issue of Online Learning Journal Published entry. Students in a fully-online learning environment have limited access to opportunities to talk about math problem solving. While discourse is a promising pedagogical model, less is known about how it translates to online math learning. We analyzed online platform data from two fully-online virtual elementary schools in the United States to address the following research questions: (a) Is participating in math discourse about reasoning and problem-solving related to students’ confidence, self-efficacy toward math, and math mindset in an online learning environment? (b) Is participation in math discourse related to math performance? The results showed that (a) repeated participation in the discourse sessions in a course was not directly related with changes in confidence, self-efficacy toward math, and math mindset, and (b) higher numbers of sessions that students participated in was associated with higher performance in final math course score and state assessment results, after controlling for prior performance and confidence, self-efficacy and mindset scores. Ahn, J. (2016). Enrollment and Achievement in Ohio’s Virtual Charter Schools. Thomas B. Fordham Institute. Boaler, J. (1999). Participation, knowledge and beliefs: A community perspective on mathematics learning. Educational studies in mathematics, 40(3), 259-281. Diener, C. I., & Dweck, C. S. (1980). An analysis of learned helplessness: II. The processing of success. Journal of personality and social psychology, 39(5), 940. __________. (2017). Mindset: changing the way you think to fulfil your potential. Hachette UK. Fabert, N. S. (2014). Growth Mindset Training to Increase Women’s Self-Efficacy in Science and Engineering: A Randomized-Controlled Trial. Arizona State University. Gatti, G. (2018). A comparison study of Connections Academy Schools to matched brick and mortar and virtual schools, examining the types of students who attend K–12 virtual school and the effects on performance of a highly mobile student body. Efficacy & Research Report. London: Pearson. Lackey, C. J. (2014). Relationships between motivation, self-efficacy, mindsets, attributions, and learning strategies: An exploratory study. Illinois State University. Lampert, M. (1990). When the problem is not the question and the solution is not the answer: Mathematical knowing and teaching. American educational research journal, 27(1), 29-63. Lampert, M., Rittenhouse, P., & Crumbaugh, C. (1996). Agreeing to disagree: Developing sociable mathematical discourse. In D. Olson & N. Torrance (Eds. ), Handbook of education and human development (pp. 731–764). Oxford: Blackwell. Lehrer, R., & Schauble, L. (2005). Developing modeling and argument in the elementary grades. In T. A.Romberg, T. P. Carpenter, & F. Dremock (Eds. ), Understanding mathematics and science matters (Part II: Learning with understanding). Mahwah: Lawrence Erlbaum Associates. McWilliams, E. C. (2015). Self-efficacy, implicit theory of intelligence, goal orientation and the ninth grade experience. Northeastern University. Mercer, N., & Sams, C. (2006). Teaching children how to use language to solve maths problems. Language and Education, 20(6), 507-528. Resnick, L. B., Bill, V., & Lesgold, S. (1992). Developing thinking abilities in arithmetic class. In A. Demetriou, M. Shayer, & A. Efklides (Eds. ), Neo-Piagetian theories of cognitive development: Implications and applications for education (pp. 210–230). London: Routledge. Rumberger, R. W. (2015). Student Mobility: Causes, Consequences, and Solutions. National Education Policy Center. Woodworth, J. L., Raymond, M. E., Chirbas, K., Gonzalez, M., Negassi, Y., Snow, W., & Van Donge, C. (2015). Online charter school study. Stanford, CA: Center for Research on Education Outcomes. Yackel, E., & Cobb, P. (1996). Sociomathematical norms, argumentation, and autonomy in mathematics. Journal for Research in Mathematics Education, 27(4), 458–477.